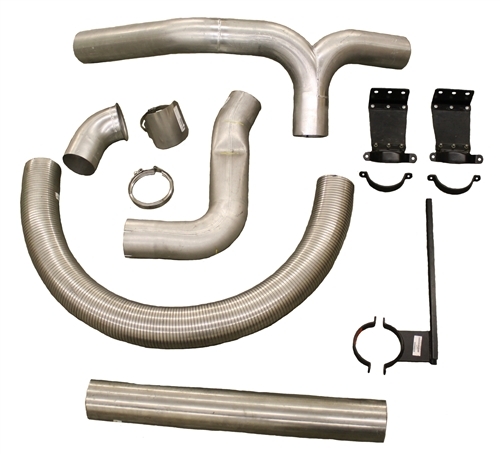 Exhaust piping kits for sale from Kustom Truck including all pipes, hoses, clamps and brackets for a Peterbilt and Kenworth glider kit from Kustom Truck. The Kustom Truck exhaust piping kits make glider kit assembly easy. Whether you building a new Kenworth glider or a new Peterbilt glider, when it comes to OEM style or chrome staight exhaust kits, Kustom Truck has you covered with quality exhaust parts. We put together custom exhaust piping kits to match your chassis configuration. The Kustom Truck exhaust piping kits can be partial kits or complete turbo to tip kits including all piping, band clamps, frame brackets, Y pipe, flex tube, cab brackets, inlet elbows, mufflers, heat shields, and stack tips. To spec and purchase a Peterbilt or Kenworth exhaust piping kit for your next Peterbilt glider kit or Kenworth glider kit call toll free 1-888-564-8890. Exhaust Piping Kit, Glider Kit Assembly Parts, Peterbilt Glider Kit, Kenworth Glider Kit.